This miniature, a contemporary work rendered in the timeless Kishangarh art style, one of the main schools of medieval Rajasthani miniature art that enormously influenced all subsequent and prevalent art styles in Rajasthan and even beyond, in its mid-eighteenth century idiom, when the great Kishangarh painter Nihal Chand rendered for his patron Raja Sawant Singh the portrait of Bani-thani and created a new and timeless model of feminine beauty and infused into entire Rajasthani painting a new spirit, represents a damsel dressing her hair with a comb in her hand. Made of wood, bone or ivory this style of comb with teeth on both sides, and the middle part, to hold, has been in fashion till late twentieth century and is still used by ethnic populace and people in remote rural parts of the country. 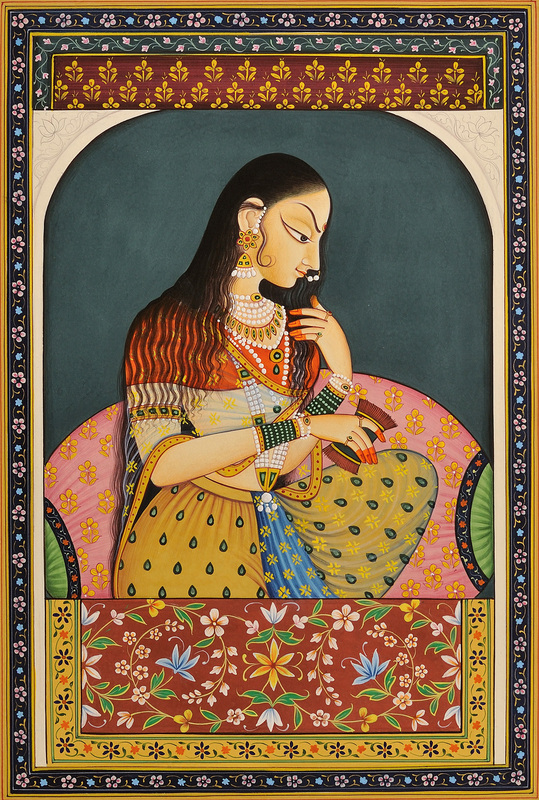 The young lady, a princess or one from the society’s upper strata, has been modeled after the iconographic perception of Bani-thani in particular and that of Nihal Chand’s model of other figures in general. The style of eyes like a tall slim fish, eyebrows, a tiny lock of hair curling over the cheek, sharp pointed nose, small thin delicate lips and a little projected chin besides her thick black long hair and a mildly curved neck as define the iconography and anatomy of the damsel in this painting are essentially the features of figures in the mid-eighteenth century paintings by Nihal Chand. She is adorning herself obviously for her lover, the hero, and is thus under the literary convention of Nayika-bhed a ‘Madhya-nayika’, a young damsel in the advanced stage of love. Her hair still slightly wet and in her routine ensemble obviously to change after she has done her hair and has applied cosmetics the young maiden seems to have just finished her bath and is now doing her hair. Thick, dark and long, her hair waving like ripples of a rivulet lay on her shoulders. She is holding the left half of it in her left hand, while the comb, in readiness to move to them, in the right. A preliminary thing she is putting on, a bit casually, a ‘choli’, a form of blouse worn on breasts and arm, an ‘odhini’ – upper wear – a see-through sheet, and a ‘lehenga’, made of simple printed textile : the entire set characteristically Rajasthani. Delightfully, the part of lehenga worn on the left leg reveals from under it the design-motifs and the colour of the ‘odhini’ : a typical Rajasthani fashion of wearing half of the ‘odhini’ under the ‘lehenga’, usually on the left side, and other half, on the right shoulder and arm. The young damsel is seated against a huge bolster inside a balconied window, the lower part, about one-fifth of the window separated with a railing, covered with an elegantly laid carpet. With purple base and yellow border the carpet has woven on it bel – creeper-patterns consisting of blue, yellow, pink and white flowers and green and pinkish leaves. But for the arched top corners and the sides built with marble and the curtain laid over the upper part, the window has been so designed that it looks more like a frame. Vertical in format the painting has been framed within a delicate border consisting of beautiful flowers, pink and blue, and a pair of tiny leaves with each of them, rendered against black base. The deep maroon curtain covering the upper part of the window consists of a border comprising a floral creeper and the field that a floral buti motif covers.